Nielsen SoundScan only dates back to 1991 – so hold on to your hats. 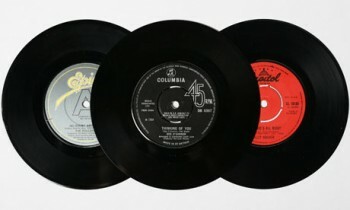 Vinyl may be on the upswing, but the 2012 sales record of 4.6 million units still pales in comparison to the all-time sales record of 344 million records set in 1977 (Sat-ur-day night fe-verrr). Nonetheless, the rise in vinyl’s popularity bodes well for those of us concerned by the takeover of the mp3 and its crappy sound quality. Sure, many of today’s vinyl consumers are either baby boomers or hipsters feigning nostalgia for a musical world they never experienced. For them (read: NOT all!) it’s more about the object, the collectible, than the sound within. But if the trend sticks, it just might have a positive residual effect on music consumers’ standard for audio quality. If the flannel-cloaked Brooklynites listen to enough vinyl, they may turn their ironic sneers upon the mp3. And this may temporarily realign the cool with the genuinely good. Keep your fingers crossed – and keep buying records!